The mega-thread for all things related to Tesla's Gigafactory, Solar City, and Tesla's Solar Roof technology! In seven years, the island nation of Samoa plans to run on 100% renewable electricity. 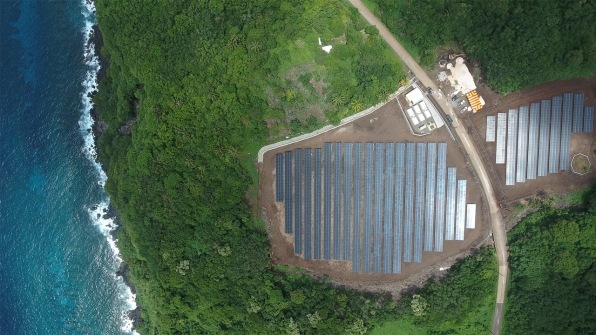 Over the last year, the local utility has worked with Tesla to install a key piece of that plan–battery storage, and also a software system that can control Samoa’s entire electricity supply. 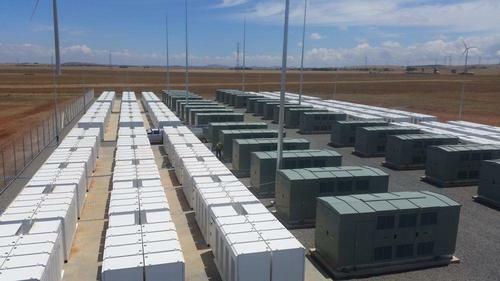 Tesla installed two of its “Powerpack” battery systems, and also developed and implemented island grid controller software that can control both the batteries and all of the power plants. “If a big cloud comes over the island and the solar drops very quickly, we can control the battery to make up the difference so we don’t have to start a generator immediately, and we don’t have to keep a generator running even when it might not be needed,” says Straubel. Since the batteries were installed earlier in the summer, the island is no longer having outages, and the electricity supply is steady. The local utility has been able to reduce the use of diesel generators, though it’s now working to tweak the system to use even less diesel. “Stability has been achieved, but we’re still working on least cost of operation,” says Fonoti Perelini S. Perelini, the project manager for the utility. “We’d like now to reduce the use of diesel generators right up to no diesel, and we’d like to move away from using diesel at certain times when there’s a lot of renewable available.” Diesel use will drop both as the utility continues to add new renewable sources and as it works to optimize the grid controller. I feel like we will see a lot of the smaller island nations moving in this direction, its hard for them to have any sort of electricity security with 1 plant, or the possibility of running out of diesel(which i have seen). I think this is a great move by Samoa i hope more of these communities jump on board. Somebody needs to do a transportable version of the power wall and panels that can be easily dropped into remote areas or to pop up work sites. It if the price was cheap enough i could see a large update in some areas. When Elon & Co. was making the big purchases and inroads to pull all of this stuff together we all knew that these technologies were going to lead into some life-changing events for people all around the world and NOW we're starting to see those changes take shape. The true test, I think, is going to be getting Puerto Rico's grid back up to 100% service. That's going to take time; the grid there was almost totally destroyed and it's a very large island. It's a big undertaking to clear out the old remnants of the damaged infrastructure (which was antiquated to begin with) and install the new one, which should see upgrades while they're installing it anyway. I think it's going to work out fine, but it's going to take time. And while things are happening, it wouldn't be out of the realm of impossibility for Elon & Co. to set up shop there too, barring any regulatory stuff. The Nevada Gigafactory battery build rate is now 20 GW a year, heading for 35 GW and there's talk of >100 GW. This is without the Shanghai Gigafactory which will build both cases for the Asian market and batteries. Tesla has also signed deals for lithium from S. America and Australia, and they'll also hav access to rare earth's in China because of the Shanghai deal. While this is going on negotiations are underway for a European Gigafactory, again both cars and batteries. Their battery partner is Panasonic, and they're happy as a drunken clam. Haha ... bwahaha .... aaaaahahahahah .... [bleeping] idiots! Tesla at $366.94, trading suspended due to the jump & news of going private. Trading resumed and it's now at $378.98, up 10.81%. The shorters just got wedgied; they were down ~$1.7 billion and so far this has added another ~$800 million to their losses. My hope is *all* current investors remain with Tesla even if were private. Would create special purpose fund enabling anyone to stay with Tesla. 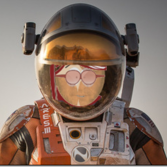 Already do this with Fidelity's SpaceX investment. Def no forced sales. Hope all shareholders remain. Will be way smoother & less disruptive as a private company. Ends negative propaganda from shorts. Absolutely. Am super appreciative of Tesla shareholders. Will ensure their prosperity in any scenario. Earlier today, I announced that I'm considering taking Tesla private at a price of $420/share. I wanted to let you know my rationale for this, and why I think this is the best path forward. First, a final decision has not yet been made, but the reason for doing this is all about creating the environment for Tesla to operate best. As a public company, we are subject to wild swings in our stock price that can be a major distraction for everyone working at Tesla, all of whom are shareholders. Being public also subjects us to the quarterly earnings cycle that puts enormous pressure on Tesla to make decisions that may be right for a given quarter, but not necessarily right for the long-term. Finally, as the most shorted stock in the history of the stock market, being public means that there are large numbers of people who have the incentive to attack the company. I fundamentally believe that we are at our best when everyone is focused on executing, when we can remain focused on our long-term mission, and when there are not perverse incentives for people to try to harm what we're all trying to achieve. This is especially true for a company like Tesla that has a long-term, forward-looking mission. SpaceX is a perfect example: it is far more operationally efficient, and that is largely due to the fact that it is privately held. This is not to say that it will make sense for Tesla to be private over the long-term. In the future, once Tesla enters a phase of slower, more predictable growth, it will likely make sense to return to the public markets. Here's what I envision being private would mean for all shareholders, including all of our employees. First, I would like to structure this so that all shareholders have a choice. Either they can stay investors in a private Tesla or they can be bought out at $420 per share, which is a 20% premium over the stock price following our Q2 earnings call (which had already increased by 16%). My hope is for all shareholders to remain, but if they prefer to be bought out, then this would enable that to happen at a nice premium. Second, my intention is for all Tesla employees to remain shareholders of the company, just as is the case at SpaceX. If we were to go private, employees would still be able to periodically sell their shares and exercise their options. This would enable you to still share in the growing value of the company that you have all worked so hard to build over time. Third, the intention is not to merge SpaceX and Tesla. They would continue to have separate ownership and governance structures. However, the structure envisioned for Tesla is similar in many ways to the SpaceX structure: external shareholders and employee shareholders have an opportunity to sell or buy approximately every six months. Finally, this has nothing to do with accumulating control for myself. I own about 20% of the company now, and I don't envision that being substantially different after any deal is completed. Basically, I'm trying to accomplish an outcome where Tesla can operate at its best, free from as much distraction and short-term thinking as possible, and where there is as little change for all of our investors, including all of our employees, as possible. This proposal to go private would ultimately be finalized through a vote of our shareholders. If the process ends the way I expect it will, a private Tesla would ultimately be an enormous opportunity for all of us. Either way, the future is very bright and we'll keep fighting to achieve our mission. Funding better in fact be secured, otherwise, the SEC is going to some hellfire down on Elon. The Saudi soverign fund just bought $2 billion in Tesla stock. Tesla hit $379.57. "Shorter burn of the century" says CNBC. About 6 months ago a global investment banker said Musk could get funding from almost any major source on the planet, from individuals to soverigns, for SpaceX etc.. Just ask. This was about the time SpaceX's valuation hit $27-28 billion after a $500 million private stock offering. This is something the shorters have never understood. BEIJING/SHANGHAI (Reuters) - Tesla Inc has started hiring for a new factory in Shanghai, according to job postings on its website, just a month after the U.S. electric vehicle (EV) maker signed agreements with local authorities for the $2 billion project. Yup. Elon's cash position is astounding right now. At any given time he could buy Bigelow Aerospace and ULA outright -- including patents and IP -- and he'd still be totally fine cash-wise. He could buy his way onto the Board of Directors for Lockheed-Martin and Boeing at any time he wished simply because he CAN. Hostile takeover, baby. Know why he doesn't? Because he chooses NOT to. Elon's not "that guy". He does what he does how he does it because he's smart. Impossibly smart. He's got ideas, damn good ones, and he wants to make good on those ideas for the benefit of everyone else and to satisfy his own intellectual curiosity. So yeah. Elon's got the talent and the tools and the money to make it happen. And better yet he will absolutely troll the naysayers and the short-sellers that are messing with his stuff. That's why he's gonna do this. And those of us in the so-called "Cult of Elon" will cheer him on in his endeavours, helping any way we can. We're gonna start fabricating awesome batteries and solar panels for our lovely sisters Mars project, kk tnx bye. Yep. Once Colony Alpha is up and running .... everything Elon & Co. (and the partners) have touched will be worth trillions. They'll be lining up just to have a stake in it. Hopefully Musk has documentation to back up his tweet or he could be facing legal liability. WASHINGTON—U.S. regulators are asking Tesla Inc. whether Chief Executive Elon Musk was truthful when he tweeted that he had secured funding for what would be the largest-ever corporate buyout, people familiar with the matter said. Officials at the Securities and Exchange Commission want to know whether Mr. Musk had a factual basis for tweeting Tuesday that the going-private transaction was all but certain, with only a shareholder vote needed to pull it off, the people said. The SEC’s inquiries, which originated from the agency’s San Francisco office, suggest Tesla could come under an enforcement investigation if regulators suspect that Mr. Musk’s statement was misleading or false. It couldn’t be learned on Wednesday whether the agency had opened a formal enforcement investigation. An SEC spokesman declined to comment. Tesla didn’t respond to a request for comment. Under U.S. law, companies and corporate officers can’t give shareholders misleading information about meaningful company events. Mr. Musk also could be in trouble if regulators develop evidence that he made a statement aimed at goosing his company’s share price. CNBC also has an article about it here. In 2013 SEC held info releases by social media are OK. The board has been discussing this for weeks, so all the major stakeholders would have known. And by now any Tesla shareholder who doesn't have Musk's Twitter and Instagram accounts in their alerts is stone cold stupid. I still wish I bought Tesla at $180 .. but I guess buying it $252.45 still wasn't bad. Tesla can go to hell. They owe me 135 dollars for over a year and they won't pay up. Not that they are saying they don't owe me, they just won't pay. He declared that funding/investor support had been secured for $420/share. If that isn't true ... it could be considered market manipulation opening himself up to lawsuits/legal issues. It shouldn't take to long for the SEC to find out if Musk was truthful or if he was just attempting to boost the stock price/screw over shorts (which he has been raging on about). Will be interesting to see how this plays out (and the future of Tesla going private).